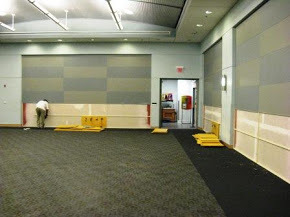 The way "Stretched-Fabric Wall System" works is a three part process using a Fabric mounting track/frame, acoustical or tackable core material and the covering fabric... First, the track is attached to the wall around the perimeter of the area to be covered. Based on the fabric width, panels can be up to 5 1/2 feet by the length you desire. The layout therefore, does not require joints every 4 feet as traditional pre-made panels. After the track is installed, the core material is then in-filled inside the tracked perimeter. The last step is rolling the fabric into the track's locking jaws. The fabric is stretched over the Tackable substrate or core material and is pulled taut as not to sag or slip over time. 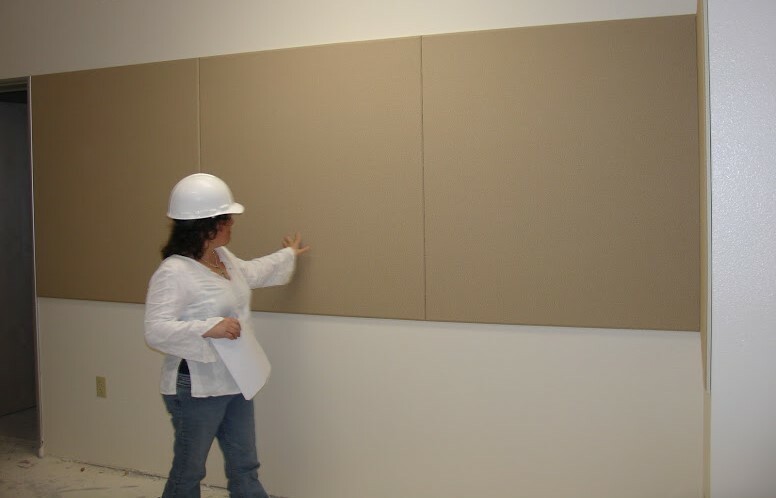 This allows us to transform the entire wall into one tackable or acoustical surface. Thus modernizing the classroom and, providing your students with the valuable benefit of reduced noise in the classroom. Turn your walls into a durable surface you can actually use TechWall’s “Stretched-Fabric Wall System” provides an attractive, tackable surface that is far superior to plain painted walls or standard vinyl wrapped tack-boards. Our unique “Stretched-Fabric Wall System” offers businesses & educational institutions with a clearly superior wall finishing solution. It turns a large amount of your wasted wall space into an attractive, functional and contributive part of your work, learning and living environments. Our system also offers HIGH-IMPACT DURABILITY with the shatter resistant frame which keeps the edges protected. 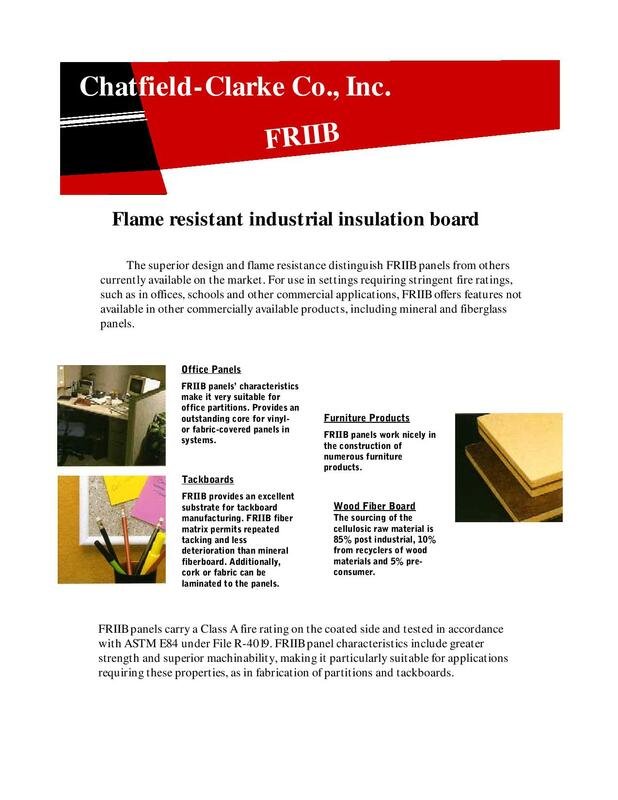 The fabric is gripped by the frame and held taut over the surface of the panel, mitigating impact damage to keep your acoustic or tackable panels looking perfect year after year. Staples, Tacks and Pins – Can be repeatedly removed and replaced without any damage to the Tackable Panel when the “Stretched-Fabric Wall System” is used in with a Tackable/Self-Healing fabric. Although our system can be used with almost any fabric, we recommend that you specify fabrics from reputable manufacturers that meet our high standards of quality, durability and sustainability, such as Guilford of Maine one of the best names in acoustical and tackable fabrics today. 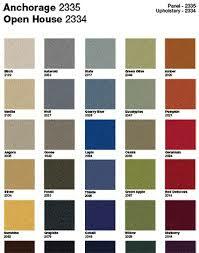 These fabrics have been specifically designed and tested with acoustic/tackable performance in mind. Tech-Wall’s ease of installation and simplicity in design allows any classroom to be modernized and improved in as little as one day. For over two decades Tech-Wall has been the go-to installer of Acoustical and Tackable Wall systems for school districts in California and around the Nation. Multiple local school districts and private schools have made Tech-Wall’s Stretched-Fabric Wall System the district standard for wall coverings in their classrooms, music rooms, hallways and auditoriums. In addition the Tech-Wall System provides the benefit of noise reduction in and between classrooms, resulting in a quieter, more enjoyable and productive learning environment. The Tech-Wall technology allows teachers and students the creative freedom to pin and hang things from walls without damage while giving the school the benefit of reducing yearly maintenance costs associated with the constant repairing and repainting of walls. Tech-Wall’s Stretched-Fabric Wall System has proven its durability over the years having been installed as both a functional and protective wall covering in over 10,000 dorm rooms throughout California including UCLA, UCSB, UC Berkeley and others. 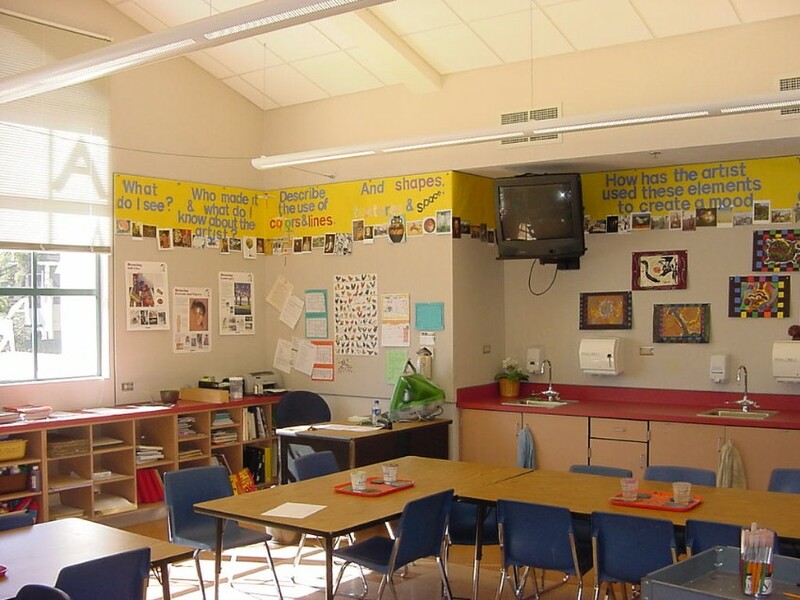 Acoustics & Noise Reduction is often overlooked when designing classrooms& schools. Tech-Wall’s “Stretched Fabric Wall System” will vastly improve the acoustics in any room. By reducing the reverberation, speech will sound clearer and sound transmission between rooms will be reduced. This translates into a quieter study area and a more enjoyable learning,working and living environment. The standard reflective Drywall & Paint even Vinyl wrapped panels are detrimental to the acoustics of a room. 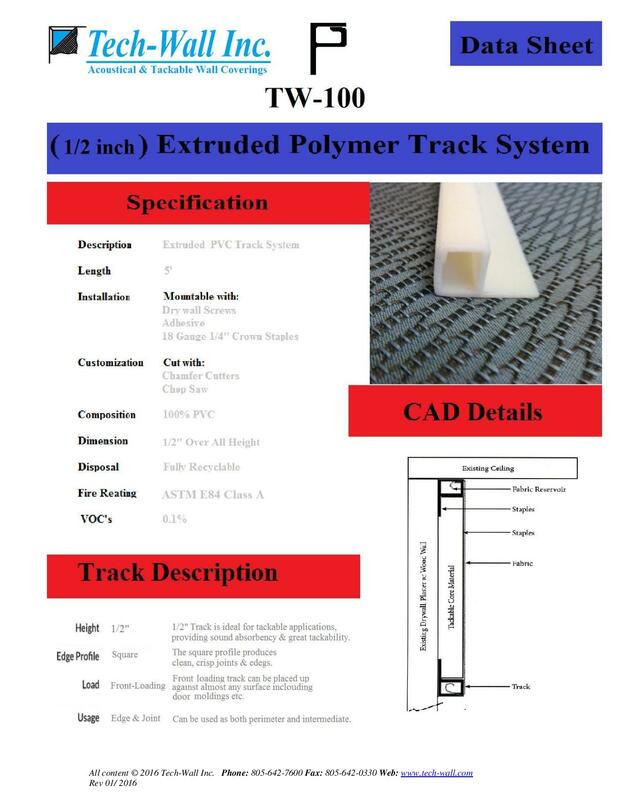 TRACK- The track holds the covering in place without the use of any adhesives. The importance of this is two fold. First it allows for the easy removal and replacement of the covering. Second, un-backed fabrics are used. 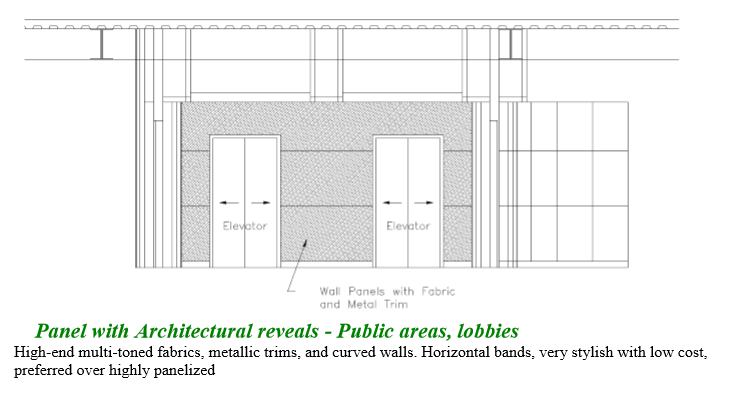 Backed or glued fabrics (coverings) are NOT acoustically transparent and will lower the NRC of the panel. Some of the other advantages of a “track system” are; the track will automatically scribe to most conditions, almost unlimited panel sizes and shapes, NO field measurements needed, little or no lead time and gives a high-tech look that is impossible for wrapped panels to accomplish. 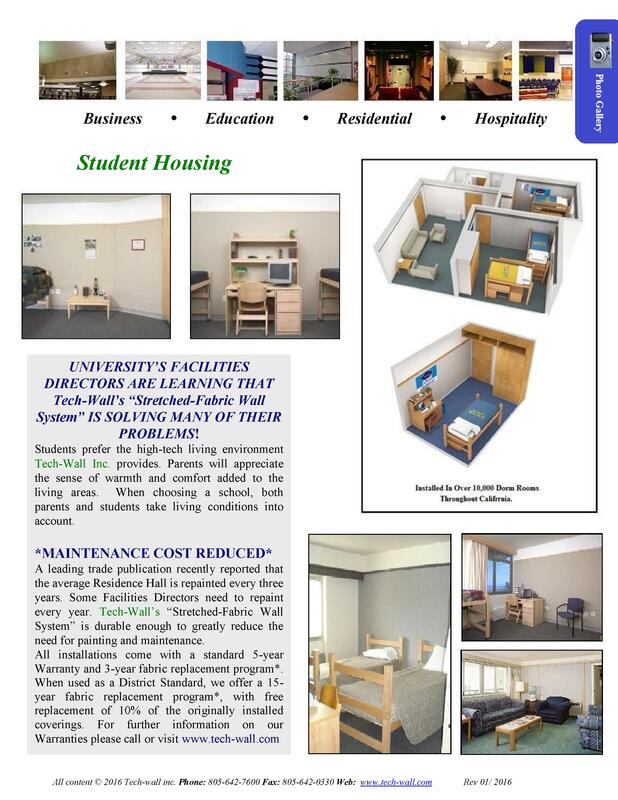 The ½ inch Tackable/Acoustical is the most popular system for Student Housing. Providing a useful wall surface with excellent aesthetics and acoustics. The most cost effective layout is a single 5½’ band “railroaded” horizontally around the room. 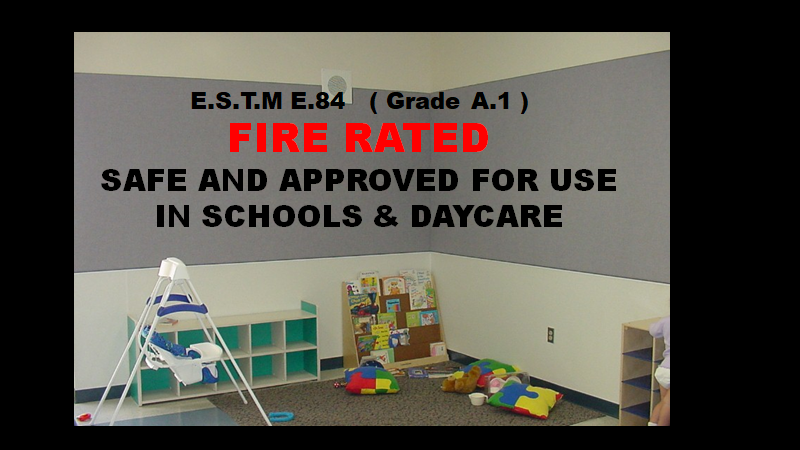 Two or more bands can be used to create whole wall coverage; this layout will not only provide the best acoustics and speech privacy but also will eliminate the need for painting, reduce wall prep and future wall maintenance (walls only need to be fire taped). Fabrics & Coverings- We recommend the use of one of the many Acoustical & Tackable Panel Fabrics offered by Guilford of Maine. Made from post-consumer and postindustrial recycled polyester (soda bottles, Guilford of Maine fabrics have the strength and durability to withstand years of use and still look as great as the day that they were installed. Durability & Sustainability! Tech-Wall’s (½ inch) Stretched Fabric Wall System will turn a drab classroom into a high-tech learning environment. Teachers and students love having the walls to use as a canvas. Whether used as learning walls, hanging up student’s work or even decorating for holidays. Our (1/2 Inch) Tackable Stretched Fabric Wall System will stand up to years of use. Backed by the only free 15-year fabric replacement program, Tech-Wall has the best warranty in the industry. Specify The Right Stretched-Fabric Wall System On Your Next Project.